Several years ago the ABC news show "20/20" did an experiment on self-control with a group of pre-schoolers. 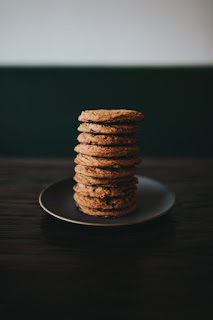 The reporter told the children they could have a cookie right then or they could choose to wait some 20 or 30 minutes until he returned from an errand and they would then get two cookies. Upon giving those instructions the reported left the room and the cameras watched how the children responded. Of course, there were several who grabbed the cookie right away and munched on it in front of those trying to be more self-controlled and hold out for the double reward. The camera was trained on them as they tried to exercise restraint. One put his head down in his arms to remove the temptation. Another closed his eyes. Others sang, or hummed and one even tried to sleep. But they mastered self-control and were rewarded with two cookies. A follow up study done years later revealed that those who were able to show self-control were happier and more successful in life and relationships. The self-indulgent ones were more anxious, more prone to depression and less successful than those with self-control. Which group do you identify with? Would you grab the cookie or could you hold out for two? Self-dedicated - Those who always want the cookie and have to have it now! They make no effort to deprive themselves of anything they desire. Self-medicated - Those who don't want to deal with the emotional, spiritual or mental pain caused by self-dedicated living and dull it by artificial means. Self-controlled - Those who, in the strength of God and in the power of the Holy Spirit, are able to defer gratification and deal with pain in order to receive the better reward. Will you surrender and live for God's joy rather than your own pleasure? Will you discipline your destructive behavior and trust God to handle your pain? Will you give control to God and give His Spirit control?